The daughter of MGM's former executive, Dore Schary, tells what it was like to grow up in Hollywood during the Golden Age. Featuring cameos by Howard Hughes, "Lady Jane" Fonda, Richard Burton, young Senator Kennedy, Marlon Brando, Elizabeth Taylor, Loretta Young, Adlai Stevenson, Sinclair Lewis, Van Johnson, Cary Grant, Humprey Bogart and many more! 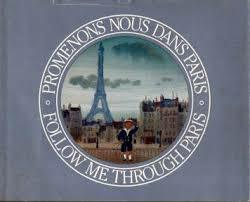 A children’s story by Jill Robinson told around "18 reproductions of original water-colors by Michel Delacroix." A girl asks her father, a painter, to tell her about his childhood in Paris.